Two weeks ago, I thought all hope was lost. We had our first loss to Texas A&M and we fell to #5 in the BCS. We had 3 teams to get past in order to get that coveted 1 or 2 bid to the National Championship. The very next week, #1 and #2 Kansas St. and Oregon lost. We were moved up to #3. All that was left was us and Georgia. The winner would go to Miami on January 7! We spent the day traveling to Mississippi for my Great-grandmother’s 100th birthday party. We knew we wouldn’t be back in time for kickoff so we set the DVR and turned off all sources of news. We set the Pandora on the iphone and happily cruised home. It came down to the last set of plays. We were ahead by a few points. GA was going for a touchdown, but we blocked the receiver in the endzone and another GA player caught it but time ran out. It was the best game of the season. Two talented teams fighting it out and heavy on the offense but defensive lines that wouldn’t let anything through. It was running and passing and everything in between. But I’m glad we came out on top. What I liked best was an article written for Sports Illustrated by someone who does NOT like the SEC and who cannot stand Alabama. ATLANTA — I want to believe Notre Dame can beat Alabama, but the problem is that I just saw Alabama. 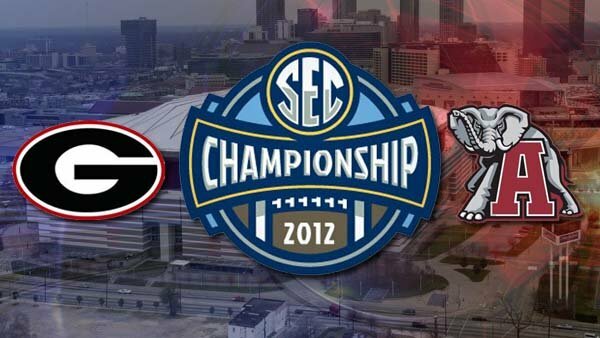 I saw a Southeastern Conference title game that felt an awful lot like an epic national championship game. I saw the Crimson Tide beat Georgia, 32-28, in one of the finest games of the last decade. I saw enough NFL talent on the field to stock the AFC West…. …..Did you see these guys against Georgia? Alabama ran for 350 yards on 51 carries, and "ran" is not the right word. This was a bulldozing. This was raw power, a muscle-on-muscle mashing of a Georgia defense that has three potential NFL first-round picks. And yeah, I know Notre Dame has a tougher run defense than Georgia, but I mean: 350 yards on 51 carries! How much tougher can Notre Dame’s defense really be? ……But mostly, this was college football being played at a higher level than anywhere else in the country. Man, I hate myself for typing that. This was a game that nobody really deserved to lose, and the lasting image, for me, was a man bent down on one knee on the field afterward. His name is Kenarious Gates. He is Georgia’s left tackle. He is 6-foot-5, 318 pounds, and it was jarring to see a man that size huddled over … sobbing uncontrollably. His face was in his hand. His chest was shaking. In a moment like that, you realize why college sports are still so compelling. "It was like somebody stabbed me in the heart." It was a brutal loss for Georgia. But it was the right result for college football, and the wrong one for Notre Dame. 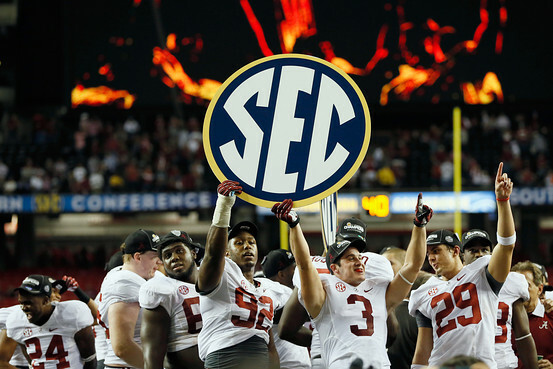 Alabama is the best team in the SEC, which means Alabama is the best team in the country. The Crimson Tide proved it again Saturday evening…. ….Surely, this has to be the best game that offensive line has ever played. "Uh, no," Kouandijo said. "Honestly, it wasn’t. We had a lot of good numbers, but honestly, we left a lot of offense out on that field. We have a lot to work on, still." Oh, I don’t want to believe that. I’m sick of the SEC. I don’t like when the same teams win all the time. It’s boring. I’m sick of Alabama, which is going for its third title in four years, the way I got sick of USC a while back. But I just watched Alabama. And then I talked to Alabama players, and besides being so maddeningly nice and aggravatingly polite, they sound so much like Saban that it’s frightening. Star running back Eddie Lacy, who ran for 176 yards and may test positive for steel, said he didn’t pay attention to any Georgia pregame trash talk, because "that’s an external factor." Left tackle D.J. 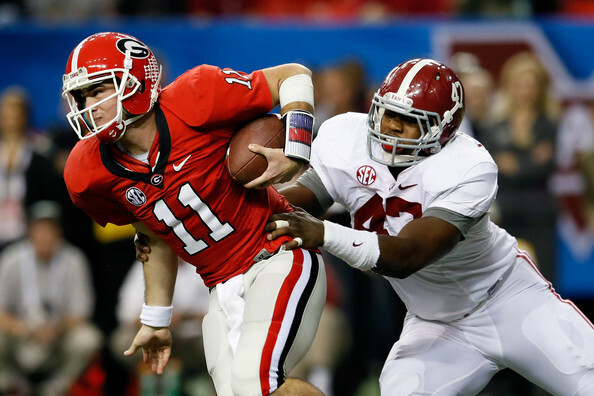 Fluker said the Tide’s success is "about preparation. We’re prepared for anything." And Warmack said he never worried about the score because "you don’t want to deviate from the program. Whatever you do during the week is how you do in the game." This is what the best coaches do. They don’t just call plays. They create a belief system and get players to subscribe to it. And that’s another problem for Notre Dame. I just can’t imagine this Alabama team getting cocky and assuming it will beat the Fighting Irish. And if Notre Dame does jump to a lead, the Tide won’t panic. There is no fear in this group. Alabama is the best team in the country. It is almost an honor when a team this good stabs you in the heart. It’s no secret that I’m a long-time die hard Bama fan. Any readers who hang around for the fall know to expect posts about games, game day, the atmosphere of Tuscaloosa, what the program means for a community, what it means for a community still hurting, and how The Crimson Tide is more than just football. We don’t play it. We live it. And we have a coach that makes sure his men leave ready for whatever road they choose. That is more than just football. So now we have a little over a month the get ready for Miami. We can enjoy the holidays and dream of bowl games. We will be a city on fire Monday, January 7th. And if we bring home the crystal again, it will be a historical win. If we do not, our boys will come home as heroes anyway. So will our coach. With a fan base like this, they’ve already won. Everything else is just icing. Roll Tide! Road to 15!!! And yes, this commercial is so very true. Spend a little time in Tuscaloosa during football season and this is what you might hear. Previous Post: « Bring on the Pizza!